In this latest installment of the Father Gilbert Mysteries, The Silver Cord, Father Gilbert races to his mother’s hospital bed where she lies delirious after a stroke. But she isn’t at peace, and her panicked words compel Father Gilbert to seek out a total stranger in a bizarre race against time. It’s a case of life and death, but whose life and whose death can’t be known until the final minutes. As the second episode, In Memorium, opens, memories abound in the wake of Clare Gilbert’s illness. Old photographs. A mysterious girl. Clandestine meetings. An old flame returns. 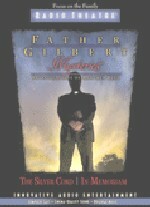 And soon Father Gilbert is haunted by the specters of his family’s past and secrets that cannot be contained any longer. Father Gilbert investigates but does not know that this time the investigation will lead him to the darkest parts of his own heart.